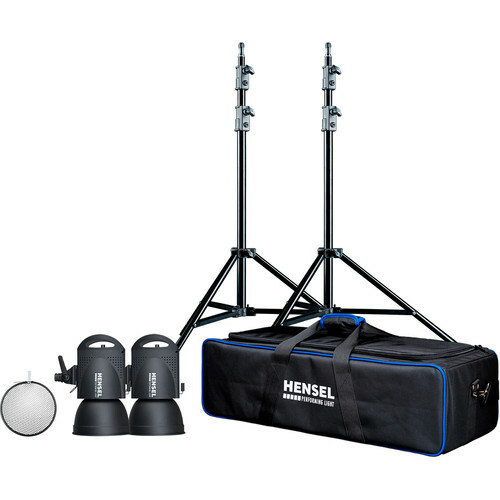 Hensel has put together this Intra LED 2-Light Kit for image-makers looking for high power and versatility in the studio or on location. The kit includes two, 5000K Intra LED continuous light source fixtures, each with a 7" reflector and a 6.4' light stand. A 30-degree grid is included for selective lighting, and it all fits in the supplied padded carry case with shoulder strap. In addition, the Intra LED light intensity is adjustable from 10 to 100%, and its power consumption is only 50W, offering a light output that is equivalent to a 500W halogen lamp. This is a reflector that will fit all Hensel flash heads. It can accept round, 7" grid spots by Hensel, or Delta, without any other attachments to add. This Honeycomb Grid provides a beam spread of 30° when mounted to a Hensel 7" reflector. Grids are essential accessories for any lighting system. These devices alter the shape and intensity of the light output from your flash heads. Consider them as a painter would a brush or a sculptor would a knife or chisel. Use of a grid will result in a small circle of light when it is attached to the front of your light source. The size of the circle of light will be determined by the density of the honeycomb, its thickness, and the distance of the subject. Store, transport, and protect up to three heads, plus stands, modifiers, and accessories in this Certo Intra LED Transport Case from Hensel. The case is black and features a zippered closure plus an exterior zip pocket. Carry the case with the dual connecting padded strap handles or the shoulder strap. Box Dimensions (LxWxH) 8.0 x 7.65 x 5.85"
Box Dimensions (LxWxH) 7.5 x 7.5 x 0.9"